Firefighters helped St. Louis Heights resident Louisa Lindow into an ambulance yesterday following a fire at her home. She was suffering from the effects of smoke inhalation. Neighbors and a passer-by helped an elderly St. Louis Heights woman escape her burning home yesterday morning. The fire at 1707 Alencastre St. caused an estimated $275,000 damage. 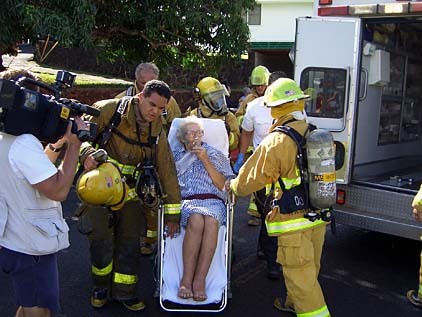 The woman who lives in the home was taken away by ambulance for treatment of smoke inhalation. Neighbors identified her as 82-year-old Louisa Lindow. Roger Long, who rents a downstairs apartment in the home, said he smelled smoke, then heard a neighbor yelling that the house was on fire. When he got outside, flames burst through the front upstairs bedroom window and shot 20 feet into the air, he said. 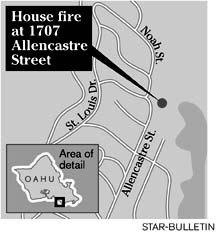 "We were trying to figure out where the smoke was coming from when I saw the flames coming out of Louisa's window," said next-door neighbor Beverly Kaku. "I jumped my wall and yelled, 'Roger, there's a fire. We got to get Louisa out.'" Kaku said she ran up the back stairs to the kitchen and Lindow was near the door amidst thick, black smoke. Another man, whom Kaku identified as Kawika Lam, ran in to help Lindow out the door and down the back stairs. Kaku said Lam lives further up St. Louis Heights Drive and had been driving by when he noticed the flames and stopped to help. Lindow kept asking about her pet cat, Kaku said. Fire Capt. Kenison Tejada said firefighters found the cat dead in the home. It had apparently been overcome by smoke. He said Lindow called firefighters at 8:48 a.m. because of an electrical short circuit in her television set. At the time, Lindow told emergency operators the fire was out and she had unplugged the television set. Lindow called back a few minutes later to say her television set was smoking, Tejada said. When firefighters arrived a few minutes later, they could see flames were shooting out of the home and called a second alarm. About 35 firefighters and seven engines helped put out the blaze. The fire was brought under control at 9:13 a.m., Tejada said. Even though Lindow was taken to the hospital by ambulance, neighbors said she did not appear to be seriously injured.